Freshness becomes a way of life. Freddy is the first blast chiller made for home use, with essential design that’s appealing in any kitchen. 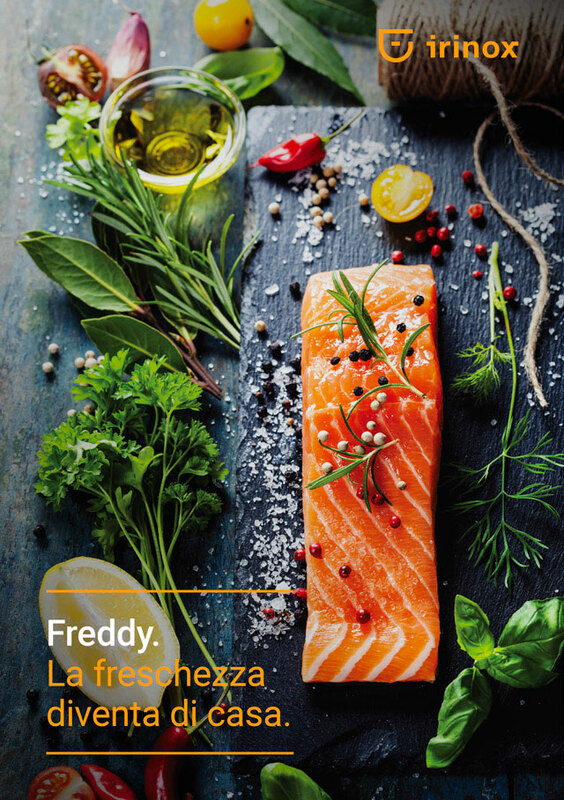 Freddy is the only domestic appliance that enables blast chilling of food straight after cooking, quickly and carefully freezing and thawing food, cooking meat and fish at low temperature, proofing bread, pizza and focaccia, holding food at the ideal temperature, and provides meals that are hot and ready to serve as well as chilling wine and other drinks. Freddy is made entirely from stainless steel, and is equipped with a probe that monitors food core temperature and an intuitive, easy-to-use soft touch control panel. Freddy is a dream come true of our very own time machine. It’s an instrument with which to lock the succulence into food at just the right moment and keep it intact over time. Flavour, vitamins, colour and consistency can overcome space and time so that they are always at their best. managing temperatures from -40°C to +80°C and offering 9 innovative functions. Quickly lowers the core temperature of just cooked hot food to +3°C. By quickly dropping through the 40°C to 10°C temperature range Freddy blocks evaporation and prevents bacterial proliferation. Ideal for preserving the quality, fragrance, colours and aromas of food, tripling its shelf life. Any cooked food can be blast chilled and kept in the fridge for up to 7 days. As Freddy quickly reaches a temperature of -35°C inside the cabinet, the shock freezing cycle rapidly takes food to -18°C at the core. In this way preservation is perfect and when thawed food will be exactly as it was when fresh. Shock frozen food can be kept in the freezer for up to 6-8 months. Ideal for hot and/or delicate food, this cycle lowers the temperature to +3°C, which gradually drops to -18°C at the core: the result is rapid but non-aggressive freezing, essential for delicate food that must be kept in the freezer. As before, more than before. Freddy thaws food rapidly with gentle ventilation that preserves the food's liquid frozen to micro-crystals. Food that has undergone controlled thawing maintains its quality and fragrance perfectly, just as if it were fresh and had never been frozen. Ideal for all food, even the most delicate. Temperature is no longer just an ideal. It takes just a few minutes to chill wine, cool soft drinks and offer guests fresh aperitifs. Freddy cools bottles at a speed of approximately + 1° C per minute, ensuring the pleasure of enjoying drinks at their ideal temperature. You’re always ready when unexpected guests turn up. This is the function that adapts to the most modern needs and meets all requirements because it allows you to choose the ideal temperature, from -20°C to +80°C, to hold your food, even the most delicate, such as gelato (-12°C), fresh fish (+2°C), and to melt chocolate in a bain-marie (+40°). Low-temperature cooking gently cooks meat and fish, never exceeding a core temperature of +70°C. It enhances flavours, maintains a tender consistency and ensures uniform cooking. For cooking meat and fish, exalting tenderness and flavour. Controlled proofing at constant temperature allows the yeast in bread, pizza and brioches to develop perfectly. Freddy makes sure all proofed items have intense flavour, a light structure, just the right crumbliness and are easy to digest. Makes bread, pizza and brioche dough easier to digest. Your food is piping hot just when you want it. By simply programming your coming home time, dishes are first held as if in the fridge, and then taken to the pre-set heating temperature. Enjoy the convenience of coming home to find your meal freshly oven heated. It’s incredible how Freddy can change your habits. Time is the new coin to spend as you like, a coin that will earn you a better quality life. The first produce from your garden, even in December. A healthy snack always to hand. Entirely safe sushi and raw fish, at home. Ready-to-serve finger food for those last-minute happy hours. A stock of your favourite dishes always ready. Home-made bread, fresh every day. Shop when you want, not when you must. Cook once a week and enjoy your leisure time.